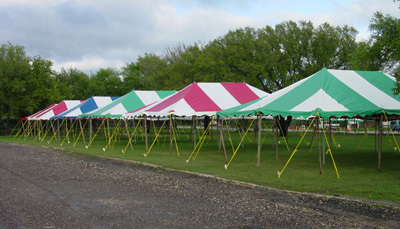 If your canopy top has been damaged, gotten worn, or you just want a new color, the 30 x30 Premier Party Tent Top ONLY is the solution you need. Designed for the 30 x 30 Ohenry tent structure, this heavy duty "Block Out" top comes in either solid white or several different stripe colors. This well constructed canopy top is reinforced with 2" seatbelt webbing around its perimeter, and is designed for the frequent use of commercial applications.